You may remember my discussing the Bloggers Take Over Twitter Taste Live event and the fact that we were going to enjoy some Hahn Estates wines and then some “Grocery Store Zinfandels” back in November. I broke the event up into two sections and will add a wine blog post specifically for the Zins later on this week. The idea behind this TTL 05 event was various wine bloggers would pick a wine or group of wines they were very interested in sharing with the world. They’d do their tastings, tweeting them of course, giving a large number of wines some good exposure. There were some interesting wines, and I swear I’ll pick up RichardPF‘s Sake selection some day soon. Other friends pooled together some Hahn wines they got from WineDiverGirl at Wine Bloggers Conference 08 and made a fun event out of it. Not wanting to be left out, I went to the store and acquired 5 of the 6 Hahn wines they were tasting. Hahn Estates does have a wine blog, though it’s about as current as mine has been. They also have some interesting information on their site about the wines, their wine club, and more. Speaking of Hahn Estates wines, lets start talking about them. The first wine I tried was the Hahn Estates Chardonnay from Monterey California. This crisp white wine retails for about $13-15 and has pretty wide distribution. 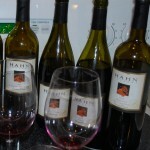 I had friends in Florida, South Carolina, and Kansas drinking Hahn wines along with me. The Chard had a lot of tree fruit, pears and apples, and was a nice, refreshing wine. It definitely had more acid than I would have expected, though it wasnt unpleasant. This wine was a pretty reasonable summer sipper, great with salads, grilled chicken or cheeses. The second wine of the night was the Hahn Estates Pinot Noir 2005, also from Monterey, CA. This $15-18 wine had a dark purple color, with a lot of blueberry and toast on the nose. I was honestly expecting a smoother, more fruity pinot, and had recommended it to friends as such. That being said, I did enjoy it, as I liked the dark fruit it offered, along with the smokey, cedar like palate. I was asked on chat if it was a good wine to pair with a cigar, and while I think it is, I am not sure if it’s PERFECT. The 2006 Hahn Estates Central Coast Meritage was next up, and I think it was a nice wine. The nose was very earthy, green and vegetal with a hint of fruit hiding underneath. The 14.5 ABV really showed, and I experienced a bit of alcohol burn on the nose when I drank this. It’s a very dry wine, with a lot of red fruit and great spice with a nice, long finish. This wine paired really nicely with the goat cheese torta, and I’ll definitely post that recipe soon, once I get permission! The 4th Hahn Estates wine we tasted was the Central Coast Syrah. The bouquet of this wine actually smelled smooth, with notes of spice that were earthy and quite pleasant. There was a little fruit on the palate, but the spice, white pepper like, was dominant. The Syrah had a very dry finish, and was medium bodied, closer to the lighter side of medium, with a nice mouth feel. This wine also paired nicely with foods, including the goat cheese torta and the feta in the spanikopita. The last wine of the night was the Hahn Estates Central Coast Cabernet Sauvignon. This wine had a pretty deep garnet red color. The nose was, well, FUNKY. It had the smell of dirt and dust, almost mossy. There was some fruit, but really, this wine was FUNKY. The palate was dark sour cherry up front, with a transition to some cedar like spice, though not a peppery spice. This wine screams for food, and the steak we had with it really brought the fruit out. It was Robin’s favorite wine of the night. I think in the under $18 price range you’ll be pleased with something as easy drinking and nice like this Cab. I assure you my wine blog will be updated MUCH more frequently. While my work projects are in full swing, I’ve already gotten the Zinfandel tasting ready to post, along with a viognier tasting. Add to that next week’s Wine Blogging Wednesday post is about Piedmont wines, and I’m cooking with gas! I have several events coming soon, including an Italian food and wine pairing event with Debbie from Savory Adventures. We’ll be live streaming a 3 course food and wine pairing, that you cant miss! We’ll have 15 people with us, mostly twitter friends, and I hope you tune to the live ustream feed Feb 28th at 6pm EST. As always feel free to contact me on twitter, or via email at matt.mmwine (at) gmail.com if leaving comments below doesnt work for you!